The Alumni Award is presented each year to honor an alumna or alumnus who best embodies the statement from the school’s mission: New Canaan Country School inspires students to be lifelong learners with the courage and confidence to make a positive contribution to the world. The Alumni Council reviews all nominations during the council's fall or winter meeting. The award recipient is determined by majority vote. The New Canaan Country School Alumni Council will present the 2018 Alumni Award to Juliana “Topsy” Post ’66. Topsy will return to campus on May 17 to accept the honor and to share with students, alumni and guests highlights of her career as an educator. This event kicks off Alumni Weekend 2018. The New Canaan Country School Alumni Council is pleased to announce that Dr. G. David Forney, Jr. ‘54 was presented with the 2016 Alumni Award. Dr. Forney returned to campus on Friday, May 20 to accept the honor and to share with students, alumni and guests highlights of his unique career as a pioneer in the field of data communications. Zach Iscol ’94 was presented with the New Canaan Country School Alumni Award on the school’s campus May 15, 2015. Katherine Ward`79 was presented with the New Canaan Country School Alumni Award on the school’s campus Friday, Jan. 10, 2014. 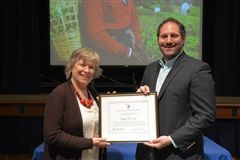 Environmental attorney Liz Barratt-Brown '74 was named the New Canaan Country School 2013 Alumni Award winner. Filmmaker Matt Heineman ’98 was named the 2012 Alumni Award winner. While on campus to receive the award, Mr. Heineman spoke to Middle and Upper School students about his journey to becoming a filmmaker. He also showed clips from his documentary on the healthcare industry, entitled ESCAPE FIRE: The Fight to Rescue American Healthcare. If you would like to nominate an alumna/us for this award, please email the candidate's name and background to alumni@countryschool.net.